ENGLAND snooker international Bradley Cowdroy clocked up 500 miles over two days but returned home to Bournemouth more than satisfied with his achievements. The 16-year-old won his first match on the national junior circuit in Derby. And he collected the winner’s trophy and £70 prize money in the second leg of the Cuestars Under-21 Gold Tour at Waterlooville Sports Bar. The defending Cuestars rankings champion took over top spot after beating Connor Benzey (Eastleigh) 2-0 in the final of the event sponsored by Waterlooville-based website Snooker Crazy. But he admitted he had to change his game after qualifying from the group stages for the knockout. He said: “I had a tough first match against Steven (Hughes). He probably played the best he’s ever played against me. “I wasn’t particularly worried (after that 2-1 defeat) because I knew I played well in that match and I played pretty well yesterday and I was confident going into today. “I made quite a few good breaks in the rest of the group stages. It was a shame not to get a first competitive ton but it was nice to play well. “Then against Oliver (Sykes) in the quarters and Jamie (Wilson) in the semis, it was more of a case of grinding it out and making it more tactical to try to get the advantage. Cowdroy recorded the day’s two highest breaks of 85 and 82 in his 2-1 group-stage victory over Londoner Ronnie Sullivan, last season’s Bronze rankings champion. Elliott Weston (Portsmouth) won his group and overcame Evan Plummer (London) 2-1 to reach the semi-finals for the first time. He was finally knocked out 2-0 by Benzey, who had edged Steven Hughes (Chandler’s Ford) 2-1 on the final black in the previous round. Home player Jamie Wilson was undefeated in his group and beat Ryan Hughes (Chandler’s Ford) 2-0 in the quarter-finals before going down 2-0 to Cowdroy. Cowdroy has a three-point lead over leg-one winner Sykes (Chandler’s Ford). Benzey is one point further back in third. 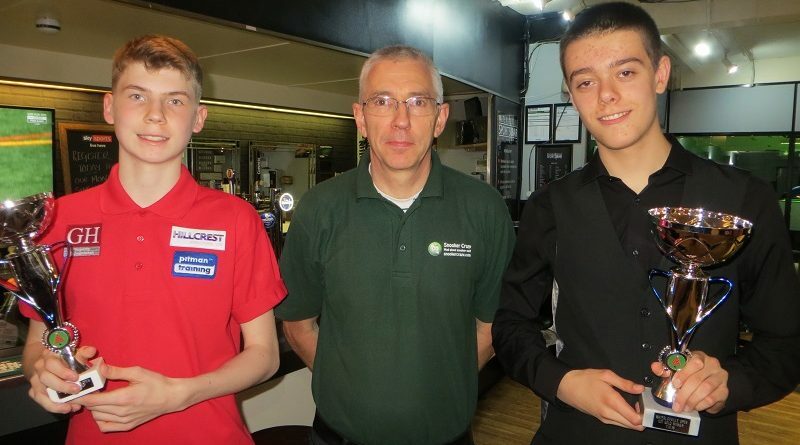 The previous day, Cowdroy beat Joe Fenton (Wakefield) 4-1, whom he had lost 4-3 to in the first leg, on The Regency Pro Tips Premier Junior Tour at Cueball Derby. Talking about his first season on the national circuit, he added: “It’s a lot of fun. It’s a different level to anything I’ve experienced before. It’s a really good learning curve. Bradley Cowdroy: 85, 82, 62, 51. Connor Benzey: 70, 67, 59. ROUND-ROBIN GROUP A: 1st, Elliott Weston (Top Spot, Havant); 2nd, Oliver Sykes (Chandlers Ford SC); 3rd, Arron Smith (Selsey RBL); 4th, Callum McDonald (Salisbury SC). ROUND-ROBIN GROUP B: 1st, Jamie Wilson (Waterlooville Sports Bar); 2nd, Connor Benzey (Chandlers Ford SC); 3rd, Evan Plummer (Frames, Coulsdon); 4th, Chloe White (Waterlooville Sports Bar); 5th, Riccardo Drayton (Chandlers Ford SC). ROUND-ROBIN GROUP C: 1st, Bradley Cowdroy (Greenbaize, Bournemouth); 2nd, Steven Hughes (Chandlers Ford SC); 3rd, Ryan Hughes (Chandlers Ford SC); 4th, Ronnie Sullivan (Frames, Coulsdon); 5th, Olly Gibbs (Fareham SC). QUARTER-FINALS (12 points): Weston 2-1 Plummer, Benzey 2-1 S Hughes, Wilson 2-0 R Hughes, Cowdroy 2-1 Sykes. SEMI-FINALS (15 points): Benzey 2-0 Weston, Cowdroy 2-0 Wilson. FINAL (£70/£35, 25/18 points): Cowdroy 2-0 Benzey. From left: Connor Benzey, Marc Lockley (from Snooker Crazy), Bradley Cowdroy.